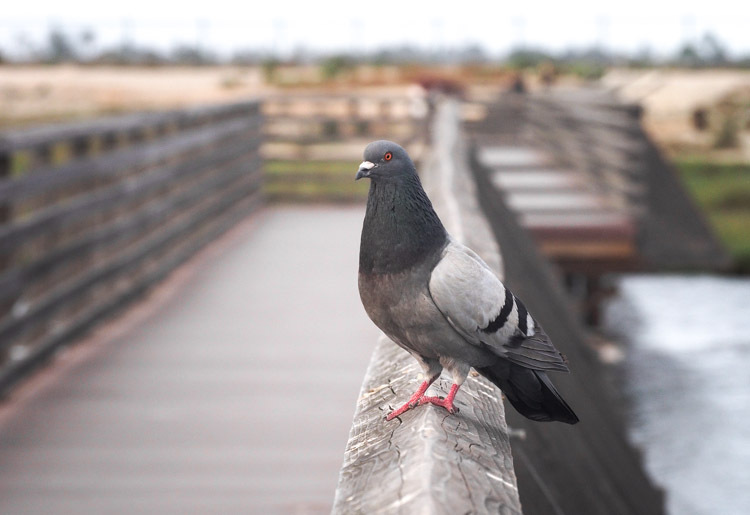 The foot bridge is a crossing over a moat, into a kingdom of feathers at Bolsa Chica Ecological Reserve. 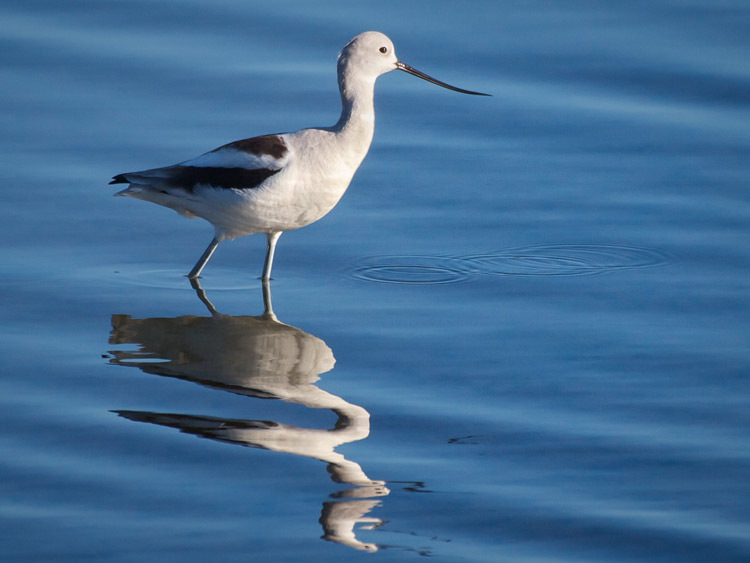 In this regenerated, re-planted Bolsa Bay, bird calls and murmurs bubble up from the terns, Sanderlings, scoters, avocets, grebes, plovers, pelicans, sparrows, Willets and egrets who call this haven home. The marsh is barely shielded from Pacific Coast Highway, with just a parking lot and thicket separating refuge from roadway. 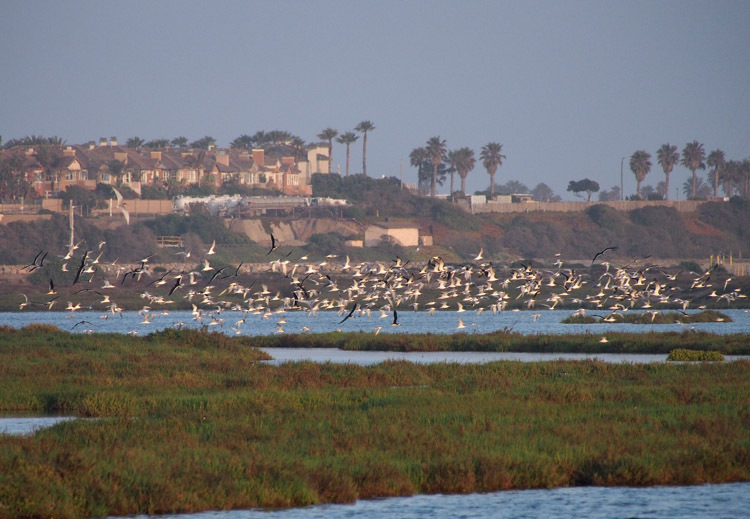 But … Bolsa Chica is a restoration marvel, now reconnected with the Pacific Ocean after a century of separate lives. 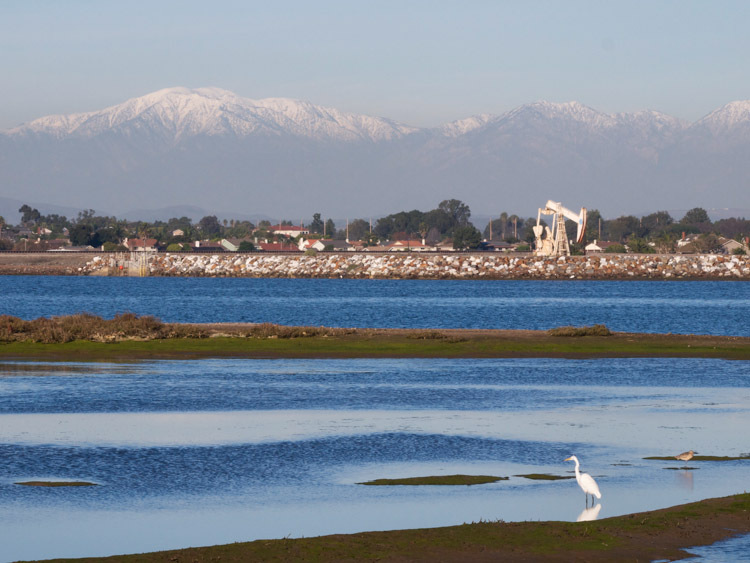 Native Americans found sustenance in these marshes — before the Spanish land grants — and before Bolsa Chica Gun Club, in 1899, erected dikes here to prevent the tidal exchange and thus improve their duck hunting prospects. In subsequent years, this land underwent a long series of modifications which included filling, oil extraction, and flood control. At 3am on August 24, 2006 tidal flow was released into the wetland for the first time in more than 100 years. Six years later, in 2012, we make our second visit to Bolsa Chica. 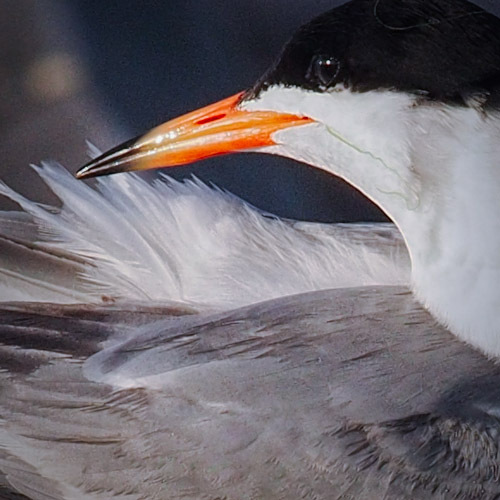 The vitality of the marsh rises from inner and outer bays, from the sanctuary islands and from the nesting scrub, as more than 200 species of birds find refuge here. Despite the influx of birders, walkers and photographers, the birds appear blasé about the intrusion, going about their fishing and foraging as if we weren’t there. 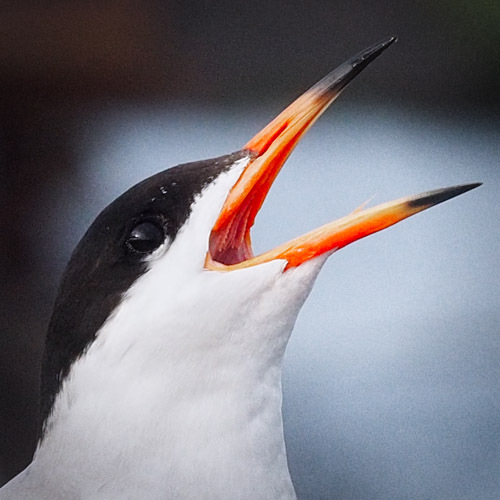 During the height of breeding season, we stroll the foot bridge under an aerial highway of inbound and outbound birds — often Black Skimmers and Forster’s Terns who have raucous islands of their own in the distance — North Tern Island and South Tern Island. They erupt in a caterwaul when raptors fly over. The skimmers, I learn (my first time photographing them), arrive in stealth and pass so quickly I barely get a photo before the sun dips. We can take care of the planet when we have good people with nature’s best interest at heart. This post helps to remind me of that when the news is full of tragedy, stories about killing wolves, coyotes and other wildlife abound. Mia, I know … and I’ve been susceptible to the psychic malaise that results from information overload. I think I’m on every wildlife list imaginable! I’m frequently torn about posting tragic content here, for that reason. It’s everywhere around us. In the very near future, I’m going to be limiting my blog posts to whatever me and my camera happen to capture and experience. If it happens to be a tough wildlife issue, I’ll tackle it. But, I’m going to keep my focus local so as to frame the issues through my lens instead of the vast landscape of issues I care about deeply, but simply can’t control. Dare I hope I’m correct in thinking that there is NO more hunting season at Bolsa Chica — and that the dikes the gun club erected in 1899 are now a thing of the past? Not sure I’m reading this right, so please clarify for me, Ingrid. That is, hit me with GOOD news, please! 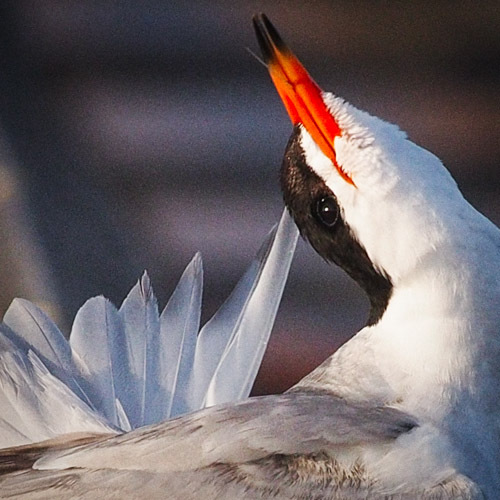 I can see why you LLLLOOOOVVVVEEEE the terns! 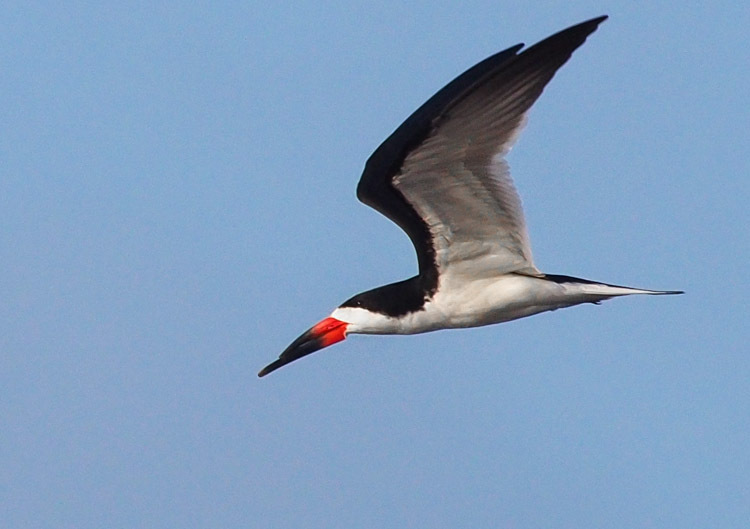 That black skimmer looks like a military jet coming in for a landing. He’s striking (pun intended)! CQ, the Reserve is a no hunting zone! I’m not sure if there is any legal hunting in the surrounding area. Most of the duck clubs, if not all, have since disappeared. 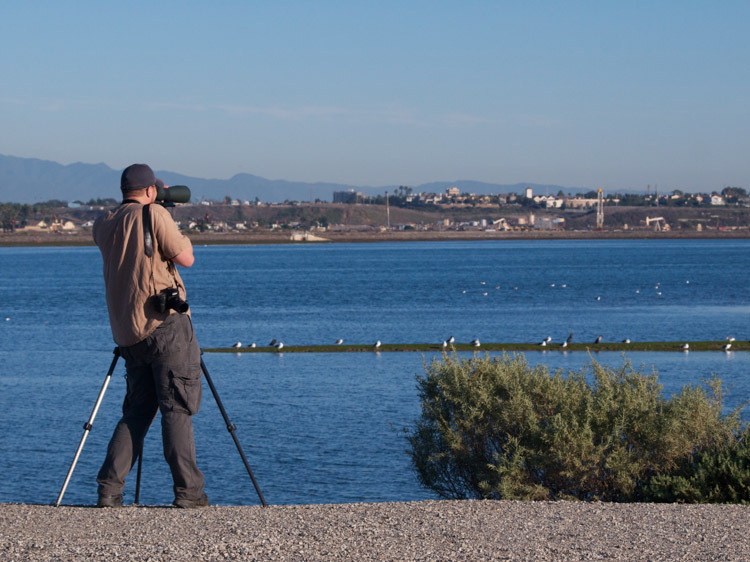 The acreage devoted to Bolsa Chica Ecological Reserve is protected and utterly wonderful in terms of what that means for the birds … and for the humans who come to appreciate them. I recently saw a photograph of three coyotes hunting for rodents in the Reserve, so this tract of land is giving life to many! I have only been twice, for short periods, and have a trip planned in June where I plan to camp out for the day and take it all in. Perhaps I’ll return with a truly decent shot of a Black Skimmer, a bird I’ve long admired but just don’t see, based on where I amble. 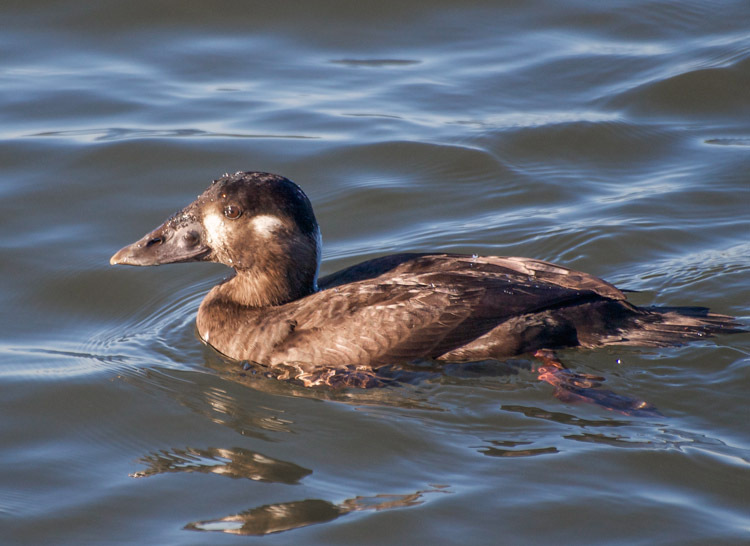 Love the variety – from beaks to bills! Great news about the restoration and secured sanctuary of their home. Every bit of good news is welcome.